Now and then I get hold of a “death card” which is worth further investigation and I am always surprised what stories these little pieces of paper can tell. The Gentlemen shown above is Herr Martin Huber, Offiziersstellvertreter (Warrant officer) in the Bavarian Infantry-Regiment No. 1 and a holder of the rare and coveted Bavarian medal of bravery. Huber was born in August 1887 and had already served in the army as one year volunteer from 1907 to 1908. When war broke out he joined the ranks of the elite 1st Bavarian Infantry Regiment “König” (King), in which he served up to his death in March 1918. The special thing about Huber was that he was a holder of Bavarias highest award for bravery in combat, the Bayerische Tapferkeitsmedaille (Bavarian medal of bravery) in silver. Even though he had already been decorated the Prussian Iron Cross 2nd and 1st class and the Bavarian Cross of Military Merit 2nd class, the medal of bravery was the highest award an enlisted men could get. It was available in two grades, gold and silver, which were held in equal esteem. 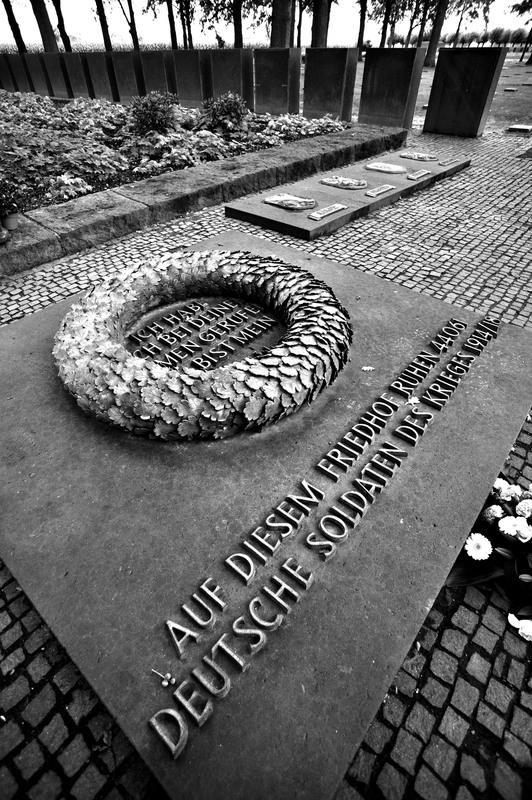 Ranking amongst the highest German orders of bravery the recipient was eligible for a monthly pension and up the days of the Bundeswehr (from 1957) the army sent an honor guard to stand vigil over grave of a deceased holder of the award. If a recipient of the order walked past barracks or similar military buildings the guard was turned out and stood to attention. Passing military personnel, regardless of rank, had to salute him. 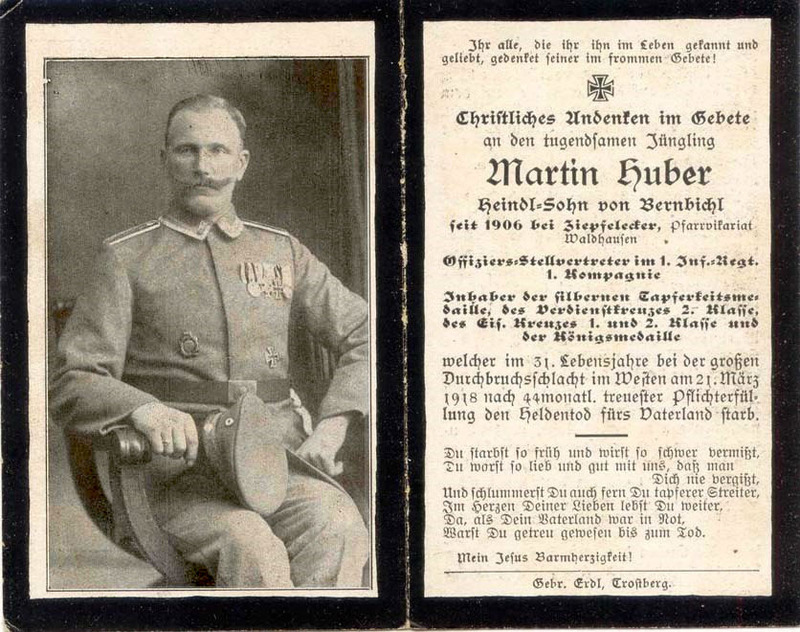 Huber was killed in action (by shellfire) on the 21st of March 1918, near Cambrai, at the first day of the German spring offensive (Operation Michael / Kaiserschlacht). His body was discovered and buried on the 4th of April 1918. 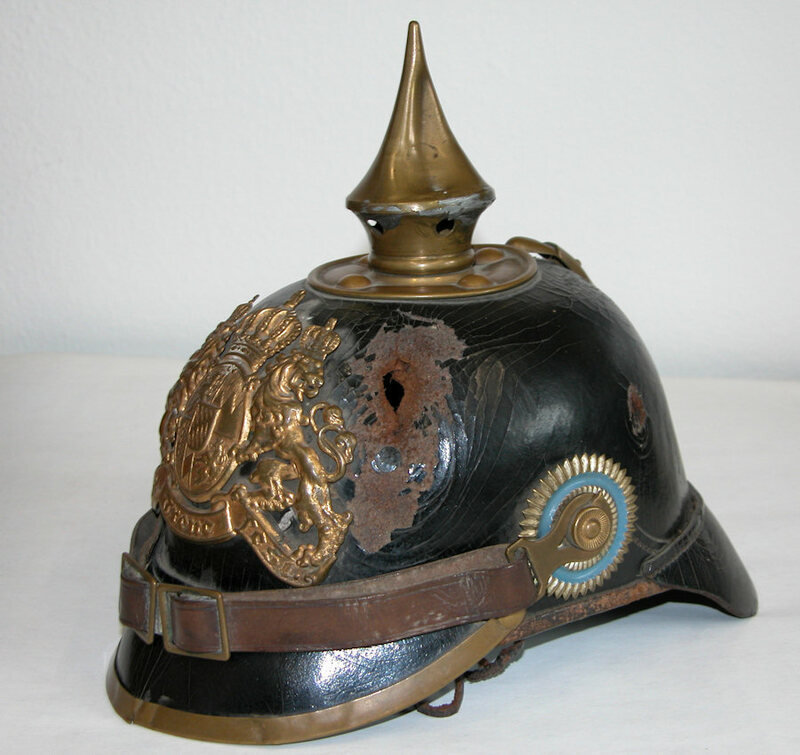 The regiment spent the whole of the war fighting as part of the 1st Bavarian Infantry Division in France. The 1st Royal Bavarian Division was a unit of the Royal Bavarian Army that served alongside the Prussian Army as part of the Imperial German Army. The division was formed on November 27, 1815 as the Infantry Division of the Munich General Command (Infanterie-Division des Generalkommandos München.). It was called the 1st Army Division between 1822 and 1848, again between 1851 and 1859, and again from 1869 to 1872. It was called the 1st Infantry Division from 1848 to 1851 (as well as during wartime) and was named the Munich General Command from 1859 to 1869. From April 1, 1872 until mobilization for World War I, it was the 1st Division. Within Bavaria, it was not generally referred to as a “Royal Bavarian” division, but outside Bavaria, this designation was used for it, and other Bavarian units, to distinguish them from similarly numbered Prussian units. The division was headquartered in Munich from 1815 to 1919. The division was part of the 1st Royal Bavarian Army Corps. The division fought against Prussia in the Austro-Prussian War of 1866. In the Franco-Prussian War of 1870-71, the division fought alongside the Prussians. It saw action in battles of Wörth, Beaumont, and Sedan, the 1st and 2nd battles of Orleans, the battle of Loigny-Poupry, and the siege of Paris. During World War I, the division served on the Western Front. It fought in the Battle of the Frontiers against French forces in the early stages, and then participated in the Race to the Sea. Thereafter, it remained on the northern part of the front facing the British Army through 1915 and early 1916. The Infantry Life Regiment was transferred from the division in 1915 to become part of a provisional German mountain division, the Alpenkorps, sent to the Italian Front. In 1916, the division went into the Battle of Verdun. After Verdun, it went to theSomme in that battle’s later stages. 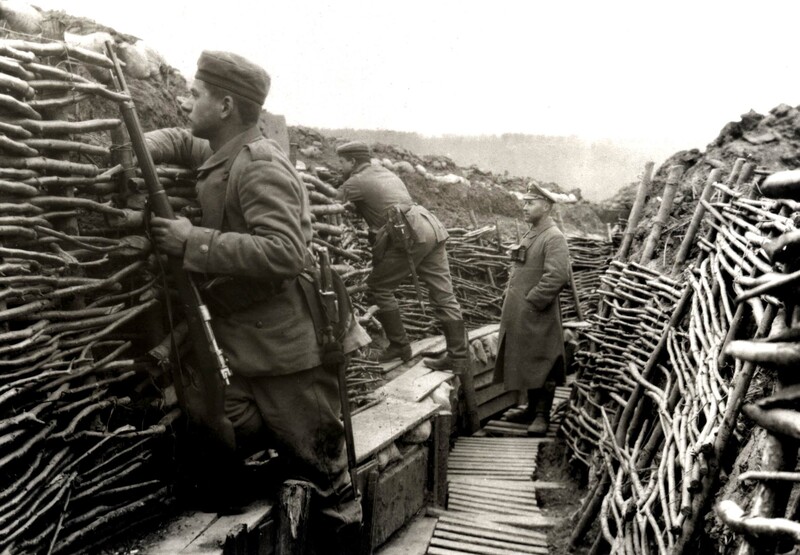 1917 was spent mainly occupying the trench lines. In 1918, the division participated in the Spring Offensive. The division was generally rated one of the better German divisions by Allied intelligence. The years I spent in the United Kingdom were among the best in my life. People made me feel like being at home and everyone was kind, friendly and supportive. I made a lot of good friends and learned a lot of things which assisted me in my later life. Because of that I still feel very much attached to the UK and its people. When I read about the terrible things that happened in Woolwich yesterday I was shocked. I made a small donation to “Help for Heroes” (http://www.helpforheroes.org.uk/) and thought about what else I could do. Starting now and ending at the end of the year I will run a series of small military quizzes on this site. To participate you need to answer all questions correctly and you have to make a donation to Help for Heroes (http://www.helpforheroes.org.uk/) or Combat Stress (http://www.combatstress.org.uk/). If you have the answers send them to me by email and include a some kind of receipt/proof that you donated something (I do not care how much) to one (or both) charities. I will draw a winner from the pool of donors that gave the correct answers. This quiz will be closed on the 9th of June 2013. Question 3: On which legendary German warship did he serve in 1914. Question 4: On the 10th of September 1914 the above warship sank the first of many British steamers. What was its name? Question 5: Who was in command of the German High Seas Fleet from August 1914 to February 1915? In case you have made a small donation to one the charities named above AND have the answers to my questions chances are good that this fantastic, original autograph card will soon be yours. 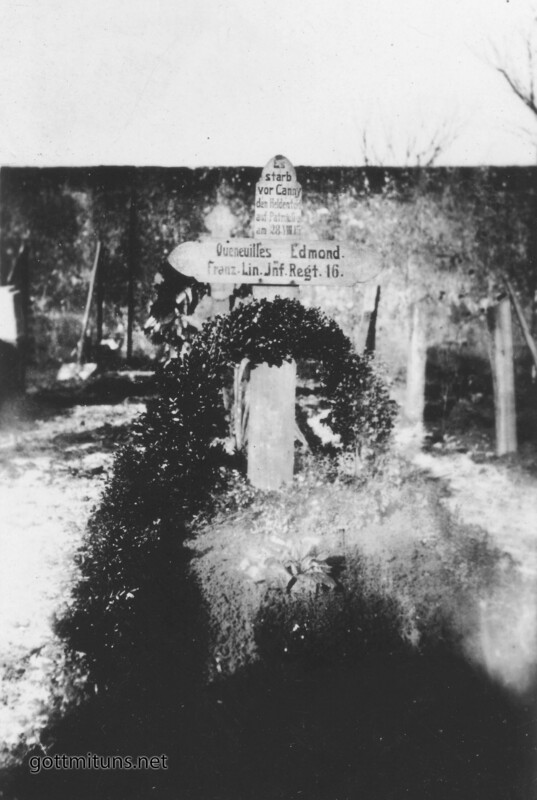 Gravesite erected for a French soldier by men of the German Guard-Regiment No. 4. A great sign of respect for a fallen enemy. No more words needed. “Whilst on patrol near Canny he died a hero’s death, 28th of August 1915” – Queneuilles, Edmond, French 16th regiment of the line. 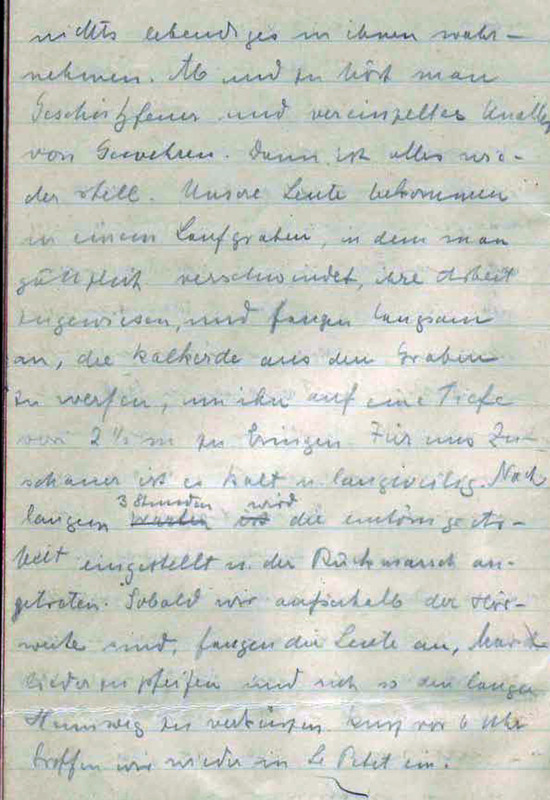 The following text is an extract from an unpublished diary of a NCO serving in Füsilier-Regiment 73, the Hannovarian Regiment in which ranks Ernst Jünger served. The diary is wonderful as it gives a fascinating insight into the daily routine of a German regiment. I do not have the time to transcribe and translate it all, so I have chosen to publish a section that was written in March and April 1915, when the regiment fought in and around the village of Courcy, near Reims, in France. Wake up call at Noon followed by Sauerkraut for lunch. In the evening it’s cleaning rifles followed by an inspection. After that we are ordered to Courcy to dig trenches there. I stay behind because I have problems with my feet. On Sunday there are no duties except muster in full gear and church service. Only the men that did not take part in trench digging go there. These are the sick men and the ones infested with lice. Lice are a widespread problem, but everything is done to get rid of them. As soon as someone notices he is infected by lice he has to report himself. He is then put into a bath and gets his uniform cleaned. We equip ourselves to march off to the trenches. To combat the lice each soldier gets a neck pouch which contains an evil smelling substance. In the evening we march out. As my feet are still giving me trouble I am allowed to load my gear and backpack onto the company’s baggage cart. Just behind Courcy it is the first time I get to see our foremost trenches. 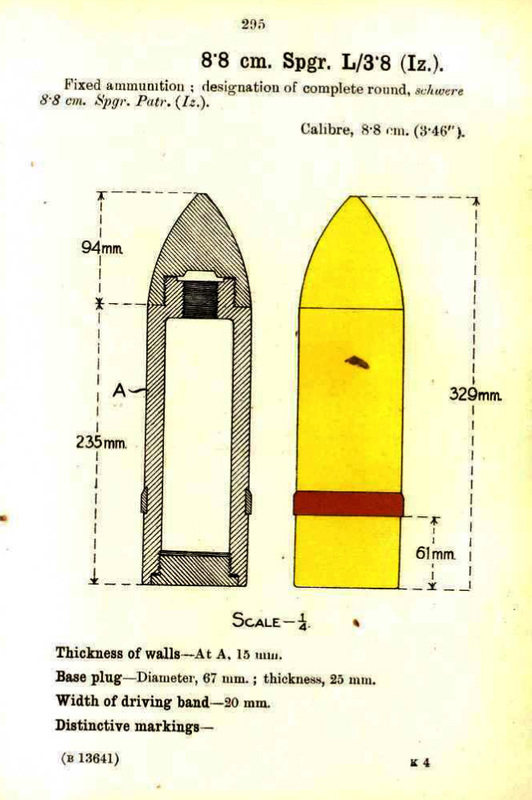 They are extremely well built, wide and deep with strong parapets, embrasures and loopholed steel plates behind which a rifleman can find cover. In daylight these loopholes afford a safe and excellent view across the terrain in front of the trench. At night the small holes are quite useless and you have to use sacks of sand as footsteps to be able to look over the edge of the trench. On the backside of the foremost trench there are various types of dug-outs. Some are virtually proof against artillery shells as they have been cut deep into the chalk ground. Larger ones, being able to shelter 8 to 10 men are roofed with massive wooden planks supported by iron beams. They won’t resist a direct hit, but afford protection against shell splinters and shrapnel balls. The ground inside these dug-outs is covered with straw and they are furnished with a table, benches or chairs and have a window opening on the backside which is blocked with straw when it is cold outside. When there is no daylight, candles are used for illumination. Our company gets alloted to a section called the “Hindenburg” trench, which is only about 200 meters away from the enemy trenches. Its part of a protruding section of our line known as the “Friesennase” (Frisian Nose). It’s named that way because it looks like a nose on the map and because it has been manned by Frisians (IR78) since September. Me and six men of my group move into a nice dug-out, the other two men are billeted in the dug-out next to us. At night time each group has to have four men on watch inside the trench while the others are allowed to sleep. The guards are relieved every 2 or 3 hours. 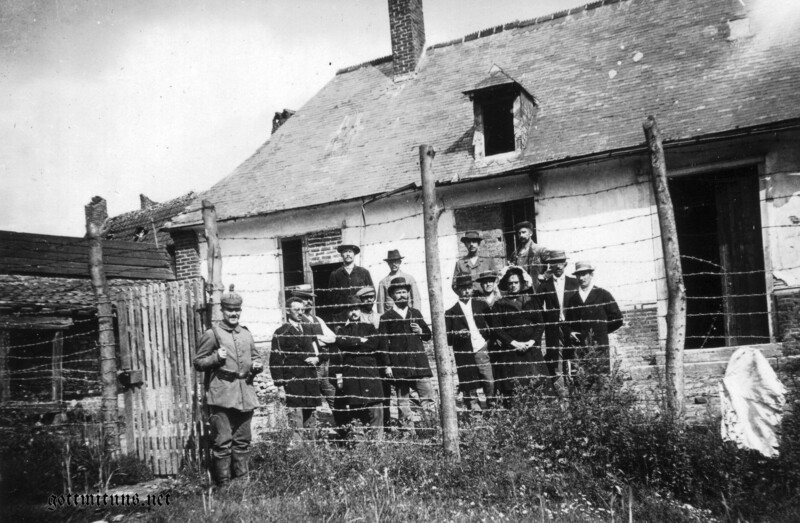 Another group has to supply men for the so called “Horchposten” (listening post). These men lie down under the barbed wire, about 30 to 40 meters in front of our trench. Access to this exposed position is through a deep and narrow trench which affords cover against infantry weapons and which is also equipped with loopholed steel plates. Our position is well equipped with weapons like machine-guns (including a Belgian and an English one), revolving cannon and lots of handgrenades. In case of an enemy barrage narrow and deep artillery trenches lead towards the rear affording the men with plenty of cover. I had imagined there would be lively exchanges of fire here in the foremost positions, but that is not the case. Only when there is something happening on our side, for example when the listening post makes his way towards its position, some enemy rifle bullets whistle towards us. Sometimes the “Franzman” also shoots partridges and rabbits that run around between the lines, but apart from that it stays surprisingly quiet. During the first nights there was a full moon and there was excellent visibility. Now we use flares to illuminate the dark terrain. A quiet day. In the evening, at 5 o clock, some artillery shells are fired over our heads. The enemy is targeting an old windmill a couple of hundred meters behind our lines, where now and then a smokey fire is lit to draw enemy fire away from other sectors of the front. The fire is lit every day and put out at about 7 pm when everything gets quiet again. Three times a day some men are sent back to Courcy to fetch coffee and food. A communication trench is leading to the village and without it, it would be impossible to reach the village in daylight. The food is generally terrible, only sometimes when it contains Sauerkraut or green beans it’s a bit better. There is plenty of bread and sometimes cheese, sausages and butter. The weather has been good so far, freezing in the nights and warm in the day. Still we spend most of our time inside the dug-out as the trench affords little room for a walk and there is a constant danger to fall victim to a stray piece of shrapnel or an aerial bomb. Each day enemy aircraft can be seen circling above our positions. They get targeted by our anti-balloon guns. Their shells detonate close to the aircraft without ever bringing one of them down. Most of the time the enemy planes do not drop any bombs. The damage they inflict stands in no relation to the danger the pilot is getting himself into. They are reconnaissance planes, mapping and photographing our positions and trenches. In modern war impressive things are done. A while ago I had the chance to have a closer look at one of our maps on which the enemy trench system could be seen in every detail. It even showed camouflaged artillery positions! Of course I can not tell just how up to date this map was, but it seemed to be a comprehensive and detailed view. The enemy trench system was subdivided into numbered sections and even sported the enemies terrain designations (like our “Frisian Nose”). All in all we live a monotonous life. There is not a lot to see. In the far distance we can see the two massive towers of the cathedral at Reims and to look over the parapet in daylight is extremely dangerous so there is not much to see there aswell. The only diversion is the mail which is delivered every morning and most of the time every comrade gets something, even if its only a newspaper from home. On the 3rd of April heavy rainfall set it which made our residence in the trenches unbearable. The rain turned the hard chalk into a sticky and slippery surface which forced us to cling to the parapet when walking the trench to avoid falling down. On the first day of Easter (4th of April) it was still raining hard, but we found consolation in the fact that the mail brought a lot of presents from home. Sadly there was nothing for me. A few days earlier I had received a parcel from my sister which contained a letter, a photographic card and the Reclam edition of Goethes “Faust“. My parcel finally arrived on the second day of Easter and the following days were brightened by all the wonderful gifts we had received from home which included oranges, cigars and cigarettes. On the evening of the 4th we left the trenches to spend the next three days in the village of Courcy which lies only a short distance behind them. Normally the battalion spends six days in the foremost trench, six days in the second line (in and around Courcy) and six days in the third line (Auménancourt le petit) about 12 kilometers behind the front, but as the 92nd Regiment only just left this area, our time in the second line gets reduced as we had to take over some stretches of their former positions. The time in Courcy was wonderful. Most of its inhabitants had left and most houses were shot to pieces, but there were some undamaged houses left which could be used for quarters. I had the luck to be billeted with my friend Leutnant Reese and because of that I had everything in abundance. I could sleep in a proper bed covered with my coat and a blanket which made it possible to undress at least partially during the nights. The first night a loud crash tore us out of our sleep and we dived into cover as we were thinking that we were targeted by artillery. On the ground I lit a candle and we waited for the next impact. It stayed quiet and in the candlelight I could see that a large oil painting which had been hanging on the wall had fallen down which had resulted in the crash. We spent the days drawing, reading and writing. The newspapers we had were already three days old, but for us every kind of news was new. The other two days were like being in paradise. Leutnant Reeses batman, who was billeted in the room next to ours used to serve in an army kitchen and was a master in “organising” everything we wished for. Ham, cheese, sausages there was nothing he could not get. In his civilian life he had been a soapmaker in Krefeld and he was a great chap who never asked for anything in return. On the evening of the 6th and 7th of April things were less cosy. At about 4 o’ clock the French started shelling Courcy which forced us to take cover in dug-outs and in the strong, reinforced cellars found under most houses in Courcy (the village was part of the outer fortifications around Reims). Down in the cellars we were safe from the barrage, but it took a while to get used to the crashing sounds of the detonations again. Yesterday evening another barrage followed, but it did little damage to the village. Most shells hit the trenches. Our 10th company, which was still in position suffered one man killed and two wounded. The machine gun company had one man wounded. Our own artillery retaliated in kind, but I do not know if it had any effect. At nighttime we left Courcy and marched back towards our position. The section we are manning now is similar to the one we were in before. My dug-out was a bit smaller and had room for only four men. Between 8 to 9.30 pm I was in charge of the guard. When that period was over I lay down to catch some sleep. An hour later enemy barrage hit a trench section close to ours. Was the enemy planning to attack? Shortly afterwards rifle shots could be heard. The alarm was sounded and all available men armed themselves and prepared to repel an enemy attack. I grabbed my rifle, put on my helmet and joined the men in the trench. The thunder of the guns and the cracking of the rifles was getting more intense every minute. Our own artillery started firing, sending its shells in a low trajectory over our heads. The night is pitch black making it impossible to see anything. When I ask around if everyone has a full supply of ammunition the answer is negative. Me and an officer’s assistant open an ammunition storage and hand out all bullets we can find. Later on a terrible accident occurred. A platoon of our pioneers sent to repair damage to the barbed wire entanglements was taken under fire by the men of our listening post. The men had not been informed about the repairs and were under strict orders to shoot as soon as they noticed anything suspicious. Expecting an enemy patrol they opened fire and killed one pioneer instantly. Another pioneer was shot through the head, he was still alive when he was recovered but he will be dying soon. How terrible it is to be killed by your own side…..
A lot has been written about “That Austrian corporal”, so I will not try to write anything here that has already been said a thousand times before, but I thought that a lot of people interested in the history of World War 1 might be interested to have a look Hitlers files, held at the “Bayerisches Staatsarchiv”. I will not comment on them, but I recommend reading this book by Thomas Weber (available in English) http://www.amazon.co.uk/Hitlers-First-War-Hitler-Regiment/dp/0199226385. It is not as bad as the reviews have it, although I read it in German language and can not comment on the English translation. “Hitler was already 25 when he became a soldier, and he was presumably a deserter. In May 1913, the sinister painter of postcards went to Bavaria “almost certainly in an attempt to dodge the Austrian draft,” Weber writes. But now, surrounded by the cheering and patriotic frenzy at the beginning of World War I, he was drawn to battle — a struggle, as Hitler wrote, that “was not forced upon the masses, by God, but was desired by the entire people.” Hitler was assigned to the Bavarian reserve infantry regiment No. 16 (RIR 16), commanded by Colonel Julius List. According to Weber, RIR 16 was not the volunteer regiment it has been described as, and List’s regiment was not teeming with students, artists and university graduates, as many Nazi propagandists would later claim. In fact, the share of budding and real academics among the roughly 30 percent of the army made up of volunteers was only marginal. Instead, a disproportionately large number of Jews volunteered to defend “the Fatherland” and, as Weber concludes, it’s unlikely that any of them suffered from anti-Semitic treatment. On the contrary, the Kaiser’s officers were apparently anxious to make it possible for Jewish soldiers to practice their faith on the front. What you see here is a “Death Card” – Death cards are “Death messages” which were distributed in a village, to friends and family to inform people about the death of a loved one and to invite them to pray for the deceased. 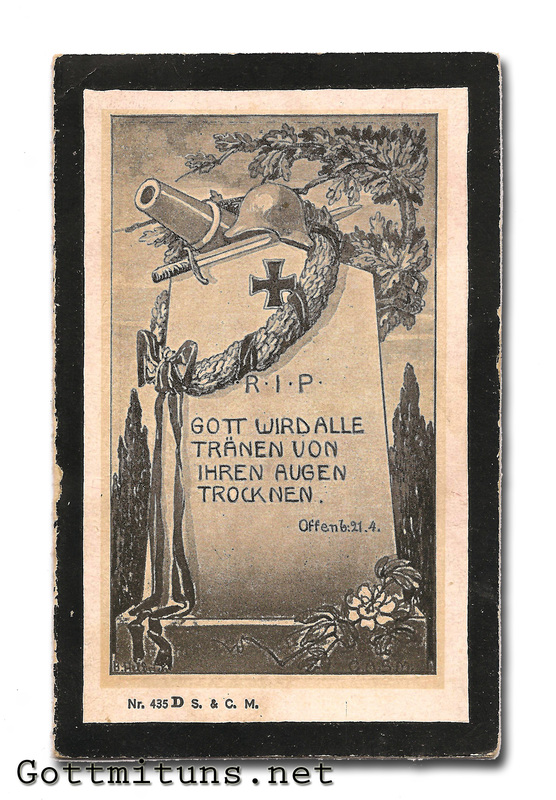 For this post I have chosen the Death Card of a Bavarian soldier named “Michael Maier”. 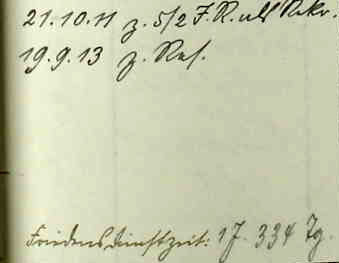 A bit of genealogical research and a close look at his regiment’s muster rolls brought up the following information . Michael was born on the 23rd of August 1890 as son of Michael and Anna Maier, a farming couple from Willing, a small village near Pfarrkirchen in Bavaria. In 1890 the village was home to about 600 people who mainly worked as farmers. 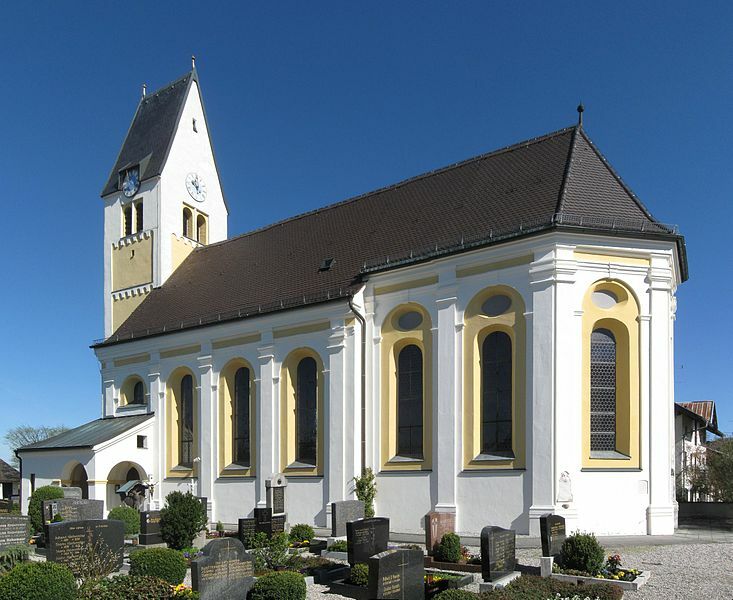 The church of St. Jacob, in which Michael was baptised. 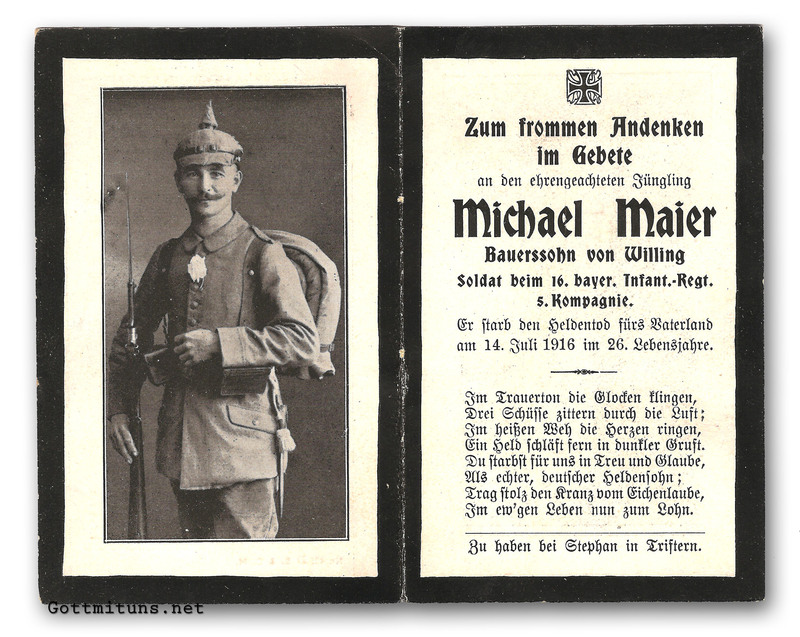 In October 1911 Michael volunteered to become a soldier, joining the Königlich Bayerisches 2. Infanterie-Regiment “Kronprinz” (5th company, II. Batallion) for a period of two years (1 year and 334 days). This was not unusual as a career in the army guaranteed a much better style of living compared to the life of a farmer. In September 1913 Michael was honorably discharged from the army. Now a reservist, he moved back to Willing to help his parents on the family’s farm. 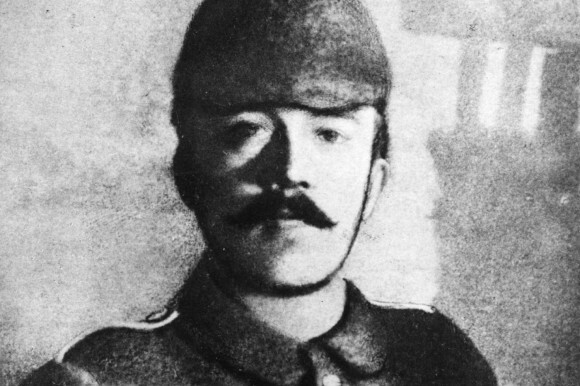 When war broke out Michael was recalled and joined 5th company of Königlich Bayerisches 16. Infanterie-Regiment “Großherzog Ferdinand von Toskana” on the 4th of August 1914. On the day Michael joined, the regiment had an effective strength of 85 Officers and 3305 NCOs and men. The regiment marched towards the front on the 8th of August 1914. Only a week later 30% (!) of the men had fallen ill from fatigue resulting from exertions of the advance. 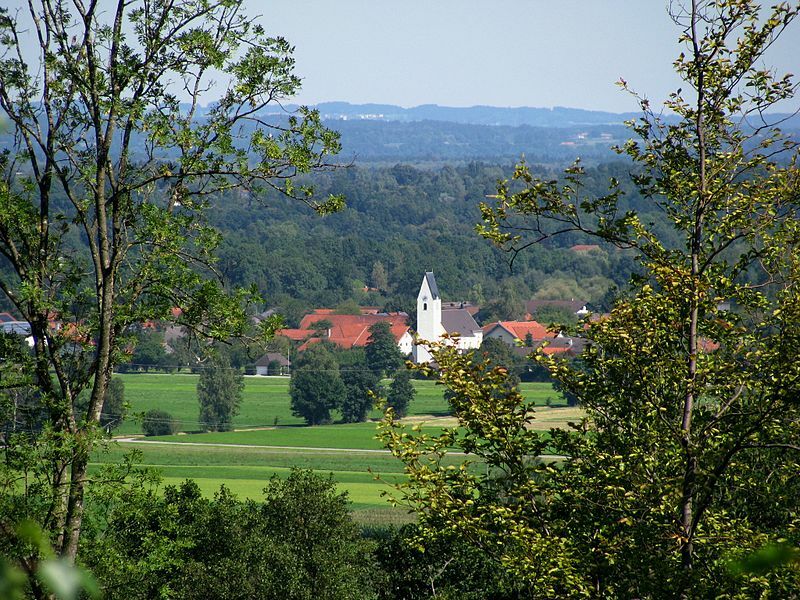 During the battles in Lorraine the regiment crossed the Saar at Oberstinzel and attacked parts of the French VIII. Army Corps taking the French completely by surprise. Breaking through the French lines the regiment reached the Rhine-Marne Canal near Heming on the 21st of August 1914. 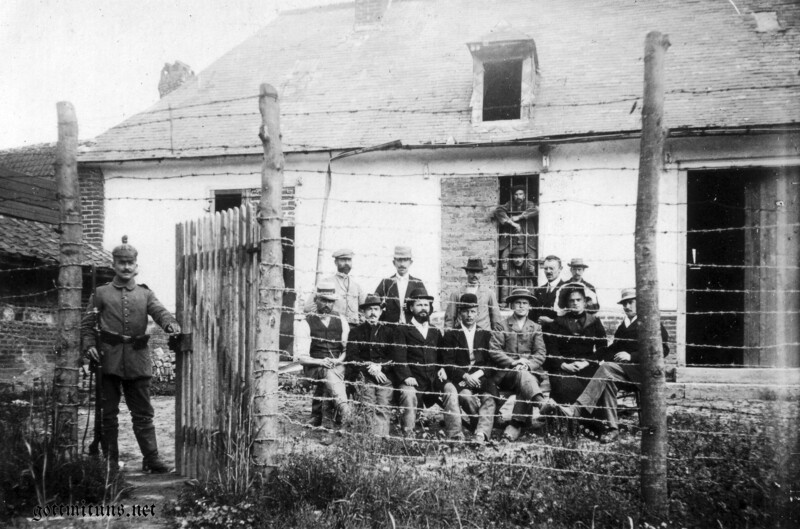 Pursuing the retreating French forces it reached Blamont on the evening of the 22nd of August, taking 200 prisoners and capturing 12 pieces of artillery and 15 ammunition carts (suffering losses of 8 officers and 190 men killed and wounded.). Losses due to fatigue and enemy action had been high. On the 28th of August 1914 the regiments 3rd Batallion had only 6 officers and 270 men fit for action (an effective strength of about 2 companies) and all officers of 8th company had been killed. On the 23rd of September the regiment was transferred to the Somme, taking part in the attack on Chaulnes and again suffering severe losses (221 dead on the 25th of September, leaving 2nd Batallion with a strength of only 210 men). Michael was lucky, he was healthy and fit and even was awarded the Bavarian Military Merit Cross 3rd Class in March 1916. 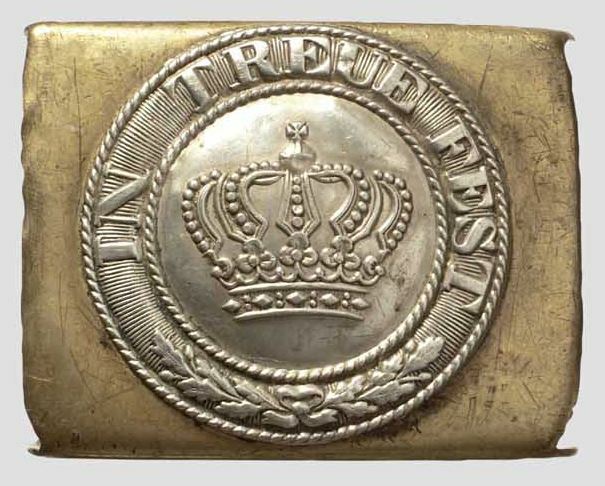 In the spring of 1915 the regiment was subordinated to the newly formed 10th Bavarian Reserve Division. It entrenched itself near Lihons in March 1915 and managed to hold its lines against repeated allied attacks up until October. 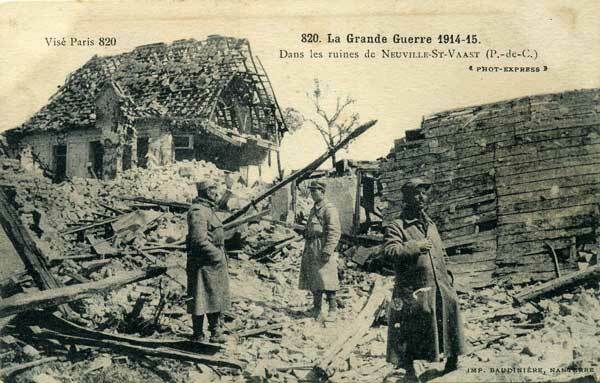 From October 1915 up until the 22nd of May 1916 it took part in the trench war around Chaulnes. During the Battle of Arras (13th of May to the 28th of June 1916) the regiment lost over 350 men to enemy action and sickness! With the start of the Battle of the Somme it was subordinated to the 28th Reserve Division forming a reserve in the area of Bazentin-Longueval. On the 2nd of July 1916 Michael’s company (1st and 2nd Batallion) took part in the assault on Montauban which was being held by the English. The attack was repelled with heavy losses (72 killed). On the 4th of July Michael’s luck began to cease when he was wounded by a rifle bullet to the left upper arm. The wound was light and he stayed with his unit which managed to hold itself in the face of repeated English attack up to the 14th of July 1916 when according to the regimental history “the English storm broke loose over the regiment”. In the fighting that followed most of Michael’s regiment was wiped out. 256 men were killed on the 14th of July alone. When the regiment reassembled a day later it had a strength of only 8 officers and 688 men and Michael was not one of them. According to the regimental files he was last seen in the fighting near Longueval. Nobody had seen him fall, he was listed as “missing in action”. About 2 years later, in March 1918, a message from the Red Cross arrived in Munich. The English had informed the Red Cross that Michael Maier had been killed by a rifle bullet on the 14th of July 1916. The message also stated that Michael had “No known grave”. His body was probably left where he fell. One of the many German, English and French soldiers that lie in the soil of the Somme to this day. Killed by disease/accidents: 1 officers, 14 NCOs and 114 men. By the end of the war there were 32 officers, 6 medical officers, 237 NCOs and 1387 men of the regiment in allied imprisonment. I remember Michael Maier. May he rest in peace. Every Easter the History Department of the Manor Church of England Academy embarks on a journey to guide Year Ten History GCSE students around the battlefields of France and Belgium. When I met one of their history teachers on Twitter and he told me that they were going to visit the German cemetery of Neuville St Vaast (also called La Maison Blanche because of a nearby farm with that name) I took the opportunity to offer a few bits of material to show the students the human side of the Kraut, the Boche, the Hun…the German soldier. I was moved when I saw the students talking about their feelings and their thoughts on the enemies of their Grandfathers. Even more so when I watched Adam (their teacher) recite Uhlands poem of the “Good Comrade”. Realizing that 99% of German students will not know if their ancestors fought in World War 1, will never have heard of Uhland and most will probably not even know when the Great War took place makes me sad. I have never seen a group of German students coming to visit the graves of the Western Front. No one remembers, our dead are left alone. What I found interesting is that the students were very keen to point how different the German cemetery looked when compared to the British ones. Neuville-Saint-Vaast German War Cemetery was established at the end of the Great War, between 1919 and 1923, by the French authorities. The Treaty of Versailles of 1919 provided for the shared maintenance of war cemeteries and so, in 1922, France granted her ‘ex-enemies’ who fell on her soil the right in perpetuity to a grave. 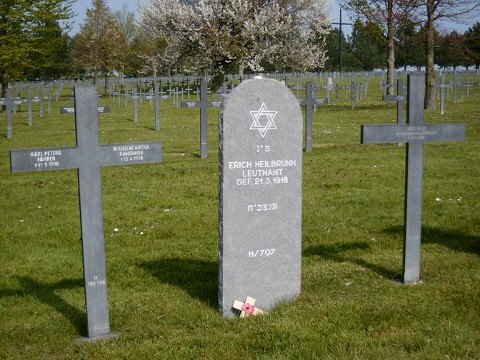 The German war graves commission, the Volksbund Deutsche Kriegsgräberfürsorge (VDK), was finally allowed to intervene in German military cemeteries in France in 1926. Starting in 1919, the French War Graves Department demolished a large number of small cemeteries close to the front and concentrated the graves in larger cemeteries. 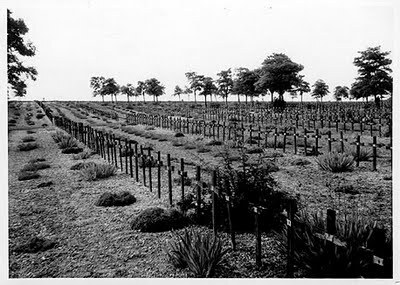 At that time, these military graveyards were simple unfenced fields with wooden crosses; however in areas of the front where the death rate had been particularly high the VDK decided to establish new cemeteries and one of these was at Neuville-Saint-Vaast, the largest of them all with 36,000 graves. The Treaty of Versailles had provided for German cemeteries to be placed under the guardianship of the French authorities (a state of affairs which lasted until 1966) which meant they had control over all the developments or permanent buildings undertaken by the VDK. The French authorities refused to return the bodies to their families. The German cemeteries were designed in the interwar years by architect Robert Tischler, a veteran of the Great War. He based his designs on two major principles: mourning and universal life. 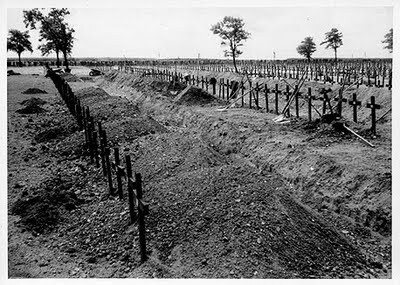 Due to the cramped nature of the concessions allocated by France, burials were carried out in large communal graves called “Comrades’ Graves”. Tischler took care to make the German cemeteries blend in with their environment, in particular fitting in with relief, as is clearly visible at Neuville-Saint-Vaast. Plants grow freely and trees are not pollarded. His choices were influenced by German mythology’s concept of communion between Man and Nature The architecture of these cemeteries is austere but leaves a lot of room for trees to “watch over the eternal rest of the soldiers”. The cemeteries often give the impression of being in a forest. They feature stone walls and wrought iron gates and, in many cases, large stone crosses. Communal graves are marked by engraved slabs often combined with rough stone crosses. In the 1920s the VDK used wooden crosses with a zinc plate, and sometimes stone slabs laid on the ground, to mark individual graves. In the 1950s the decision was taken to generalize the use of erect crosses to give a better visual portrayal of the extent of the slaughter, and for these to be made from durable materials (aluminium, cast iron or stone). Each cross or headstone bears the surname, first name, rank, date of birth and date of death of the soldier concerned. It has often been suggested that it was the Treaty of Versailles which obliged the Germans to choose dark-coloured crosses for their military cemeteries; however if this was the case the rule was not strictly applied because in many cases white crosses were used. A more practical analysis suggests that the dark colour of many of the crosses in German military cemeteries corresponds to the need to protect the original wooden crosses with tar-based paints. Many of the crosses which can be seen today, made from stone or steel, were installed in the 1950s and 1960s. As soon as Hitler rose to power the VDK was placed under official supervision. Remembrance of the Great War was a significant political issue for the new regime and it shifted emphasis on to the heroism of the soldiers and any aspect of reconciliation was removed. Furthermore the architect Tischler made no attempt to hide his strong sympathy for the Nazi regime. During the Second World War the VDK was placed at the disposal of the Oberkommando der Wehrmacht and in 1941 placed, albeit implicitly, under the guardianship of the Hitlerjugend or Hitler Youth. The VDK was quickly reorganized after the chaos of 1945 and, in spite of his pro-Nazi stance, Tischler returned to his post. The German cemeteries which can be visited today are the fruit of structural work carried out in the 1920s but the main “funerary objects”, the crosses, were for the most part designed after the Second World War. At the entrance to the largest graveyards stands a “memorial hall” which is in some cases decorated with sculptures or mosaics. A wonderful, valuable and worthwile project. I am proud to have been able to support it.